Several years ago, we were framing a fairly large-sized house. We had one of the younger (greener) guys on the crew buttoning up some sheathing that we couldn’t do while the wall was still on the deck. The work was simple, albeit somewhat high up. His job was to carry partial sheets of sheathing up the ladder to fill in the “holes” and to finish nailing the bottom of the sheathing that tied into the lower structure. Unfortunately, the ground was wet and his ladder was set up improperly, a recipe for disaster. While carrying up a sheet, the bottom of the ladder kicked out and slid down the wall. Luckily for him (and me), the ladder actually landed in a window opening directly below which stopped his fall and prevented major catastrophe. There is nothing more horrifying than potentially hurting someone, especially some one whose safety is ultimately in up to you. 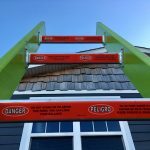 The reason I tell this story is that ladder safety has always been one of the biggest issues when it comes to overall job site safety. 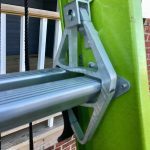 I recently had a chance to check out the Little Giant HyperLite SumoStance Ladder. Upon first inspection, there were several notable attributes of this ladder. The first thing I noticed when opening the ladder was the weight. I honestly expected it to be lighter. With a name like HyperLite, I guess I was expecting some ladder made of balsa wood. Despite its’ name, this ladder still has some heft. The second thing I noticed was the color, it’s bright, not a little bright. Think aircraft beacon bright. The ladder was designed this way on purpose and I will touch on this later in the article. The final thing I noticed is the most important. At the bottom of the ladder there are additional feet, that extend, to widen the base. This is the SumoStance technology that really make the ladder unique. Little Giant has been at the forefront of ladder innovation since its inception. They began with the widely popular “fold-up” ladder that is now ubiquitous on job sites. Each ladder they release is chalk full of great innovation and this ladder is no exception. 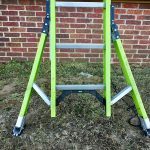 Although I expected this ladder to be lighter, it is still lighter than other comparable ladders on the market (50.2 lbs for the 24’). With ladders, I will always take “sturdiness” over weight any day of the week, and this ladder offers both. With a 300b weight limit, it strikes the ideal balance of strength to weight, and I found absolutely no issue with the weight. 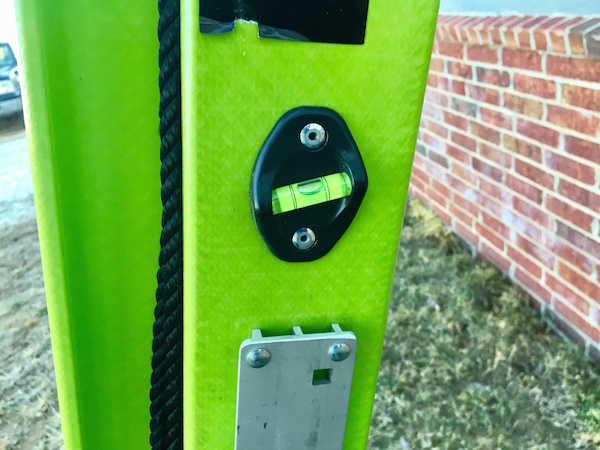 The HyperLite SumoStance Ladder comes in an extremely bright HiVis green color scheme. They say it is the most recognizable color to the human eye. 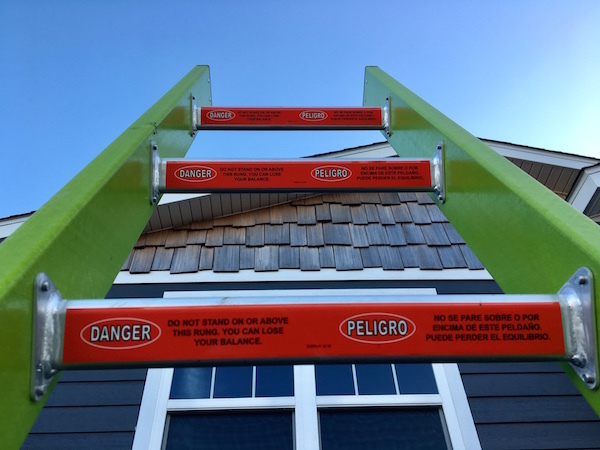 This is designed to eliminate accidents that involve simply not seeing the ladder. 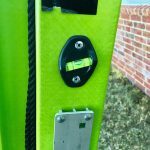 Whether that be from equipment or simply people on the job site running into, it is NEVER a bad idea to make a ladder more visible. 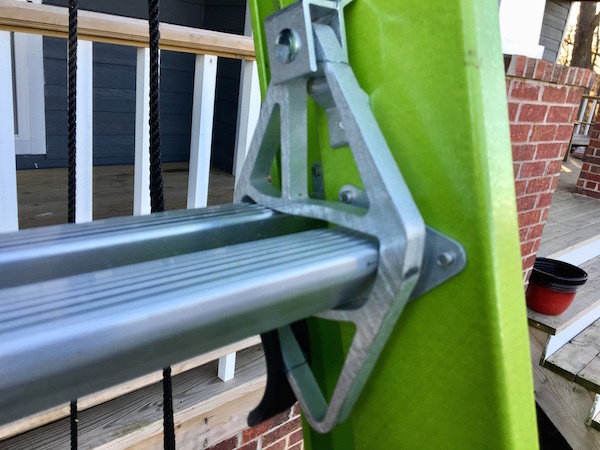 While many ladder manufacturers offer adjustable feet, Little Giant has incorporated a patent-pending technology that allows the feet to be positioned flat or in a “spike” position SAFELY. 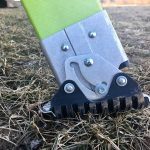 This is extremely important if you are working in soft, wet conditions (as mentioned in the story above) or on harder flat surfaces. The feet also offer nail-slots to even further prevent slipping. the HyperLite SumoStance Ladder also offers two bubble indicators. One reads when the base of the ladder is level sided-to-side, and the other shows when the ladder is at the optimal 75.5º front-to-back. 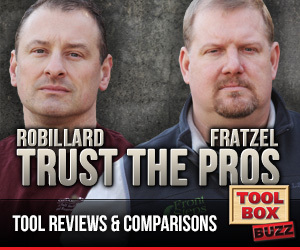 While this may seem a little “gimmicky” to many seasoned carpenters, it is especially helpful to novices and DIY’ers. Personally, I found this to be very helpful and used it more often than not. I assume most tradesmen have had issues in the past with the rope and pulleys on their ladders. If you are like me, you find them in your way and usually harder to operate than just lifting the ladder without. Little Giant has addressed this issue by moving them from the middle of the ladder to the right side. 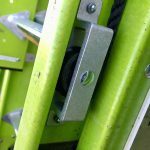 This gives them ample room to put two (2) pulleys which reduces the amount of force necessary (up to 45%) to raise the fly section. 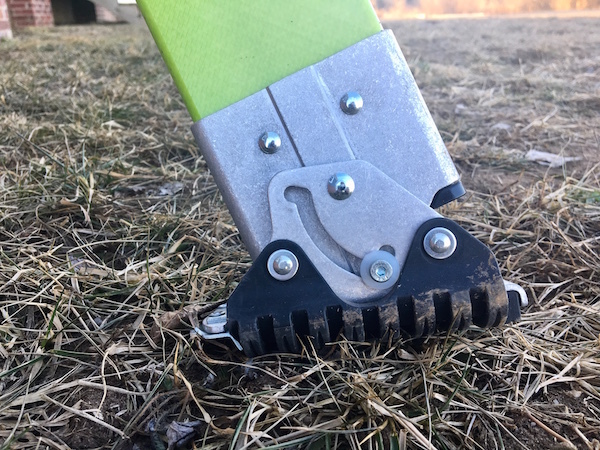 This also moves this parts from the middle (underneath your feet) to the outside of the ladder eliminating a trip hazard. The rope works great. Everyone knows you are not supposed to climb on the top three rungs of a ladder. We do it anyway. Little Giant has made these rungs a bright red to serve as a reminder. I am not the best when it comes to personal safety, and it has been a goal of mine to improve upon this. 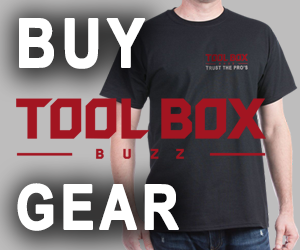 This feature is a great reminder and it is fantastic for new guys/gals to help keep them safe. This also helps to get proper height above a roof in which to grasp the ladder. 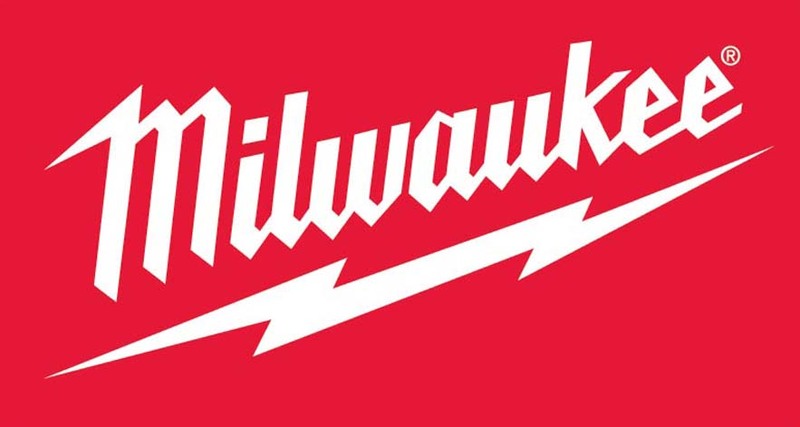 While I thought this was a little overkill at first, I find myself subconsciously abiding by the “rule” which is ultimately better for myself and my company. The most innovative and, frankly, most important feature on this ladder, are the outriggers. Every pro tradesmen has stuck a scrap piece of wood or rock under their ladder in order to get it more level. While this has “worked” for years, we’ve all known it isn’t safe or in the best interest of our companies. We just do it to get the job done. 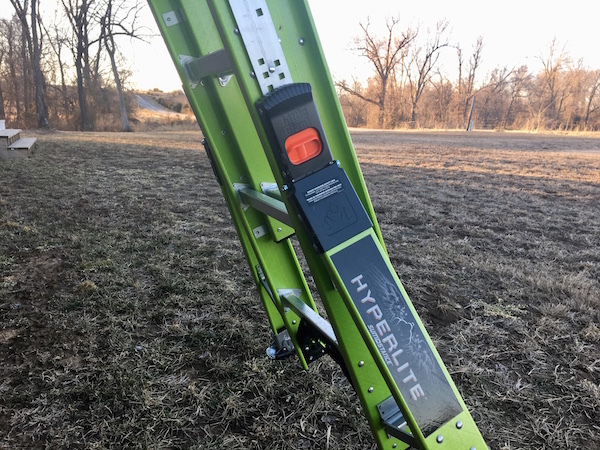 The HyperLite SumoStance Ladder tackles this problem head-on with their outrigger system. You simply press a button and the outriggers move adjusting to terrain while simultaneously widening the stance of the ladder. This offers amazing stability side-to-side which helps with over-reaching and helps plumb the ladder vertically on uneven terrain. 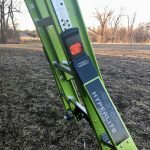 I have been using the HyperLite SumoStance Ladder as my primary extension ladder for several weeks now and have found it durable and easy to use. 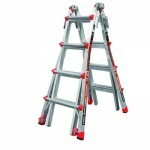 The ladder is very intuitive and the SumoStance outriggers are very easy to use. It is very steady and being able to precisely dial in the correct front-to-back angle is a game changer. This ladder is not just for “greenies”. The dual-pulley system works great, and I love that I’m not tripping on a rope at my feet. 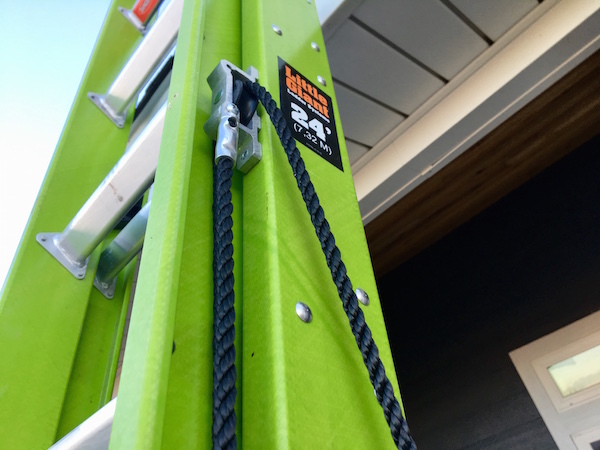 While Little Giant has done an extraordinary job in creating a fantastic ladder, there are a couple improvements that I would like to see them address. I occasionally had a tough time switching the feet from flat to spike mode. With a little practice, this wasn’t too big of a deal, but when you are holding a ladder vertically, the last thing you want to be fumbling with is the feet. I also found one of the the SumoStance outriggers to be tough to move. It works well and locks-in great, once it begins to move. However, the button to engage the outrigger was stiff, and I eventually had to add lubricant for it to operate properly. After using this ladder, I can honestly say that Little Giant has once again hit a home run with their newest offering. 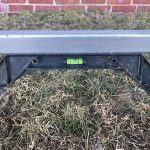 The HyperLite SumoStance Ladder is tough, lightweight and offers game-changing innovation that other manufacturers are simply trying to copy. 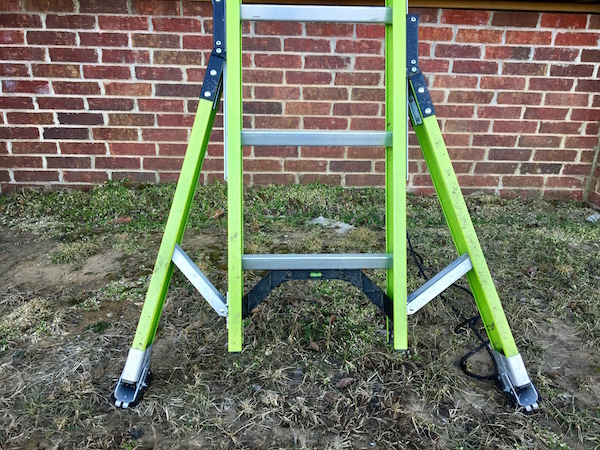 Pro’s and DIY’er’s alike will benefit from the many features on this ladder. It WILL offer more safety and productivity. 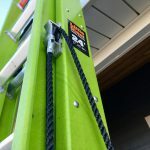 Although it is not cheap (the best rarely are), I, without hesitation, recommend this ladder to anyone that is looking for a great extension ladder. 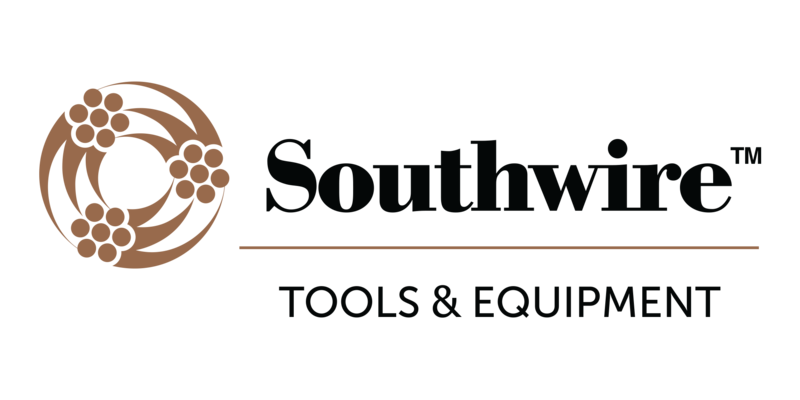 READ the following ladder usage and ladder safety tips and familiarize yourself with the OSHA guidelines For Ladder Safety. The liability when working on a job site means taking roof and ladder safety seriously.